Being in the food industry, I've always been interested where our food comes from. When I try a new variety of a farmed product, it's amazing how climate, soil, cross-pollination, water, etc. plays an important part in growing something incredible. Farmers are really artisans, especially when collaborating with chefs and developing these special ingredients. Outstanding in the Field, the California-based "restaurant without walls" is making its first-ever farm dinner visit to Hawaii. 'Outstanding in the Field' founding chef Jim Denevan did his first farm dinner in his hometown of Santa Cruz, California in 1999. 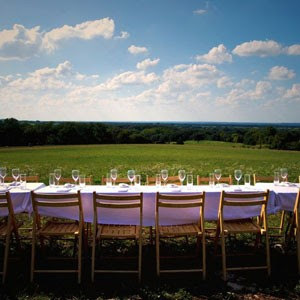 By 2011, they have staged 87 dinners throughout North America and for the first time, in Europe. This month, they're kicking off the season in the Hawaiian Islands.